Read our pocket guide to Marmaris and Antalya for some invaluable insider's knowledge to these fabulous coastal resorts on the glorious Turkish Riviera. Boasting smart marinas, quiet coves, lively nightlife and beautiful beaches, these resorts offer a treasure trove of hidden gems and entertainment. We’ve made it our mission to discover everything you need to know about Marmaris and Antalya for your next holiday to Turkey. 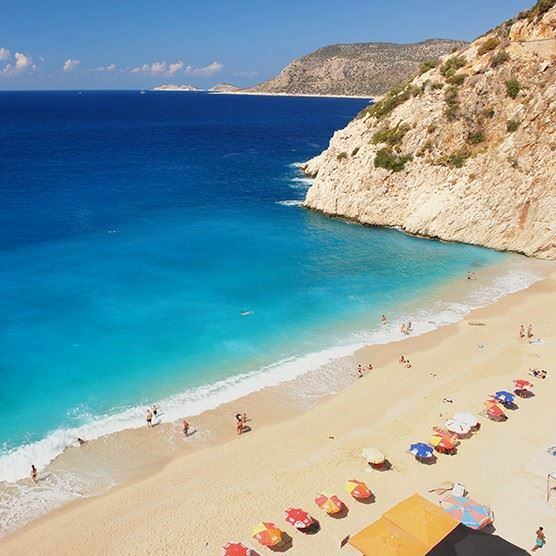 Discover more laid-back and lively holiday resorts with our handy guide on where to stay in Turkey. If you fancy a change of scene or simply want to walk off your superb seafood lunch with a sunset stroll, take a walk along Marmaris' vibrant promenade (from the Marina) and you'll end up in neighbouring Icmeler - a quieter and greener resort where the emphasis is on relaxation. Icmeler is distinguished by its quaint old village and mountain-fringed bay, perfect if you're seeking a serene afternoon in the sunshine or want to sunbathe on the enticing sands of Icmeler beach. Meanwhile, idyllic Antalya, sitting right on the bay, combines a modern vibe with the charms of the beautiful Antalya Old Town. Find travel advice for Turkey holidays, including visa information with our Turkish travel information. Did you know a holiday to Marmaris can also be a holiday to Rhodes? The gorgeous Greek island of Rhodes is less than an hour away by catamaran, where you can wander the cobbled streets of the old town and take in the ancient Roman ruins - or just enjoy some tasty Greek mezze in an authentic taverna! Whatever you decide to do there, a quick trip to Rhodes while you’ve got the chance is a Marmaris must! It might not be quite on a par with New York or London when it comes to shopping, but there are certainly plenty of things to do in Marmaris, especially if you like a cheeky bargain. The Grand Bazaar is a brilliant place to haggle for jewellery, leather or clothing and the Mallmarine Shopping Centre has quality goods worth snapping up. So don’t forget to keep space in your suitcase for the return journey if you’re planning some retail therapy! Anyone who’s been to Turkey before will know what a hammam is, but what you might not know is that in Marmaris you can enjoy your traditional scrub down and massage in a 16th century Turkish Bath. Suleymaniye Hamami is rolling in rich history, after it was built for the great Suleiman the Magnificent! This 450-year old historical building and authentic hammam experience certainly makes this a once in a lifetime day at the spa! In fact, how about heading straight from Marmaris airport to a wonderfully relaxing hammam session to start your Marmaris holiday in style? Marmaris is a haven for divers, with a whopping 52 dive sites in the area! Baca Cave is one of the most famous and is locally known as "the chimney" thanks to its narrow shape. The depth goes from 5 to 50 metres making it a great site for beginners and experienced divers alike, so do your best Santa impression and shimmy on down! You might expect a seaside resort like Marmaris to be all about the beaches, but there’s actually just as much on offer inland. Go on an adventure up Marmaris mountains, or sail or kayak the Dalyan River – there’s plenty to tempt you from your sunlounger when it comes to action packed days out. With a long summer season, there's always a great time to go to Marmaris. For a laidback evening, head to Antalya’s Roman Harbour, from where you can gaze at yachts and the majestic Taurus mountains. Check out some fantastic family-friendly Antalya hotels and make a night (or weekend and more!) of it! Head to Marmaris Town Square at 9pm and you’ll be met by a dazzling water display as the illuminated ‘dancing fountains’ put on their show. Why not have a wander down to the bustling square after dinner to watch the fountains dance before you throw some shapes of your own on Bar Street Marmaris? Marmaris is famous for its Ottoman castle which is now home to a museum, but we think one of the most interesting facts about the castle is that it was actually built (or rebuilt from an earlier attempt) by 'modestly-named' Suleiman the Magnificent, the longest reigning Sultan of the Ottoman empire. It might not be the humblest title in the world, but there’s no denying Marmaris Castle is indeed as magnificent as the man who built it professed to be. If you consider yourself a bit of a culture vulture, you'll find lots to love at the alluring archaeological sites here! As well as its famous castle and atmospheric old town, the region also has spectacular sites including the intriguing Carian rock tombs – temple-like Lycian tombs cut into the mountainside to create the final resting place of the Kings of Caunos. While you can’t get up close to these, you can see them perfectly from a boat - so don’t forget your camera, they’re quite a sight! Beyond the brilliant beaches, cocktail bars and fun tourist attractions, there's a fair share more of Marmaris to see - such as its incredible national park of almost 30 hectares! There are plenty of things to do in Marmaris for nature lovers, who will be in awe over this beautiful greenland overflowing with flora and fauna. Feel free to hop on a Jeep or horse safari too - it's a popular way to see the park in all its glory.